I reckon I could live on tofu, eggs and fish for at least a month before getting sick of the combination. Healthy and yummy ingredients. I especially wish we could eat more tofu, but believe it or not, tofu is actually quite expensive here! Sadness. 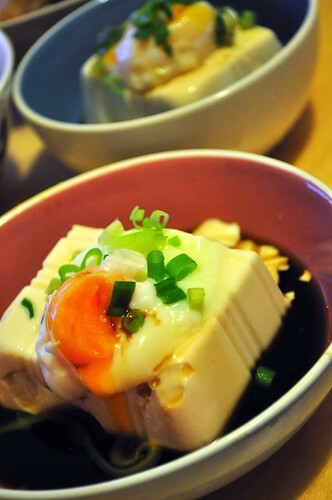 A new recipe, onsen style eggs which I poached in boiling water for 10 minutes, then cracked on top silken tofu with a dressing made of mirin, soy, sugar and dashi soup stock. With the rest of the tofu, I dusted with light coating of seasoned plain flour and pan fried till crispy with a drizzle of teriyaki sauce. 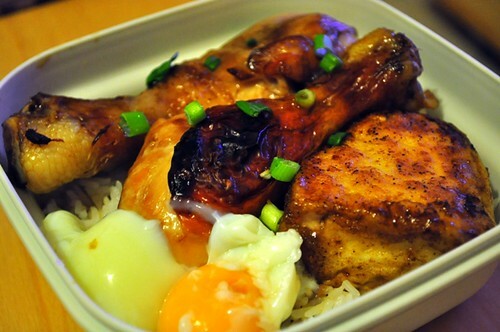 Packed it with oven baked drumsticks, and half boiled egg for our lunch bento the next day. 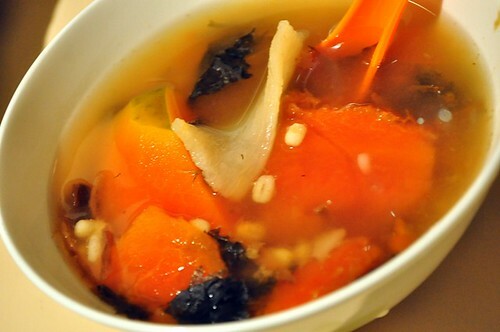 I’m still going on my slow cooking soup spree, this one was papaya, huai shan, barley and bamboo shoot leaves soup. Tomorrow I’m going to try cooking soup with pork ribs instead, I bought a whole pack during the weekend, can’t wait! Today I had breakfast with some female colleagues before work. We were there to try out the cafe where her hubby works as the general manager and head barista. I was kinda embarrassed when she introduced me to the cute 19 year old barista as ‘the coffee aficionado’. ‘this is the one you want to impress’ she said which I protested ‘ no no! I’m just learning!’ But it was too late, the sweet boy looked at me earnestly with ‘ ahhh….’ eyes. Oh dear. I think my daily cups of Velvet takeaways have given my colleagues the wrong impression that I’m a real coffee nut, when in truth, I am just so lucky to have the lovely and mighty Velvet within a stone’s throw from my office. 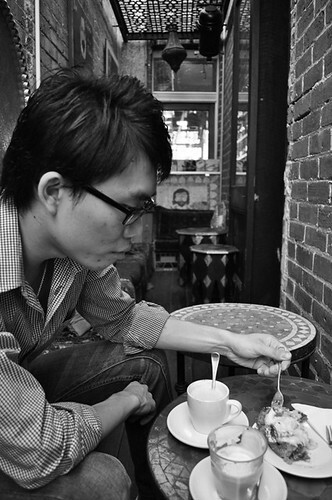 Speaking of good coffee, I’ve known about Boucla since my uni days (and that’s very long ago). Back then I was completing a placement at an organisation located opposite, I once offered to buy coffee for my supervisor and she solemnly said ‘the best is at Boucla’. Of course I wasn’t interested in coffee back in those days and was more interested in stuffing my face with the gorgeous jam donuts from the nearby Jean Claude Pattiserie. This little cafe is practically an institution in Subiaco, always very busy and popular amongst the locals. 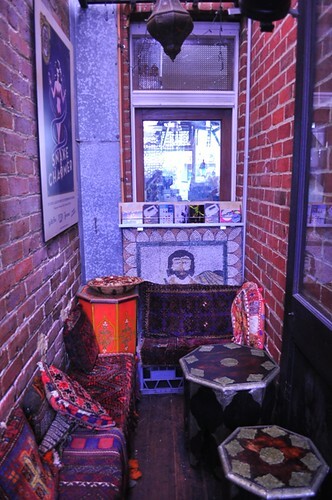 The interior of Boucla is dim, warm and exotic, someone once described it as ‘Aladdin’s cave’ and that’s the perfect description. 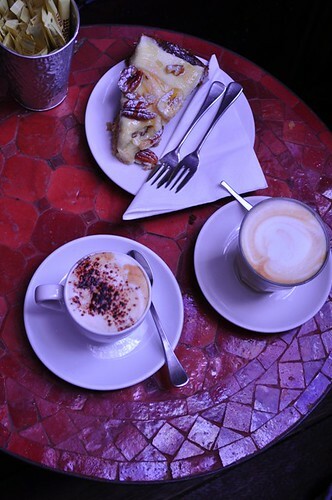 A mini treasure trove that serves fabulous coffee and cakes. It’s difficult to find a good cafe that serves great coffee AND great cakes in Perth. It’s always one or the other. Cakes too often are stale, dry or mass produced. But the cakes and tarts and little treats in Boucla makes one salivate, you don’t know where to start, you can’t make up your mind. The beautiful vegetable filo tarts, chocolate and ricotta cake or fresh, colourful greek salads? 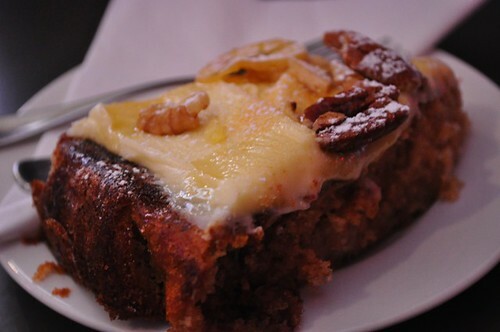 We settled for the banana walnut cake which was gorgeous, so moist, with chockful of nuts, crispy banana chips, sooo good. I wish I could have some now *sad*. My coffee was fantastic. I tried to sip it bit by bit to savour the creaminess, the smooth texture, the fragrance, but it was too late, I drained away my glass and R laughed at my sad face, knowing that I wanted more. It went so well with the cake, or should I say the cake went so well with my coffee? Enough said. My new favourite cafe. I will be returning. Bou tong meaning slow cook soup or boil soup in Cantonese. I really love Cantonese soups which require hours (ok maybe just 2 hours) of boiling then simmering and reboiling again. I’ve never been very good at it but I’m getting the hang of it now and discovering new ingredients and soups along the way. 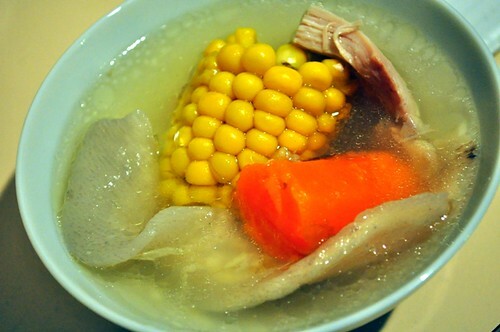 Slow boiled chicken soup with carrots, sweet corn, huai shan and dang gui. Herbally flavour but not too strong or bitter with the sweetness of sweet corn and carrots coming through. 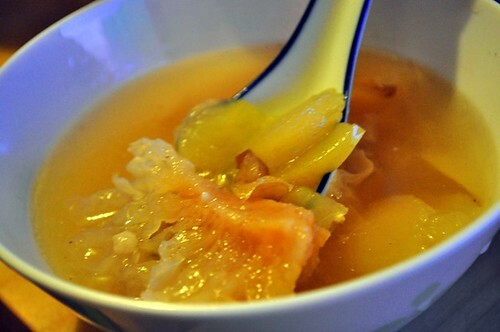 Pear, apple, water chestnuts and white fungus soup which could pass for ‘tong sui’ or sweet soup if I added sugar instead of salt. I really like fruit based slow cooked soup and am trying to figure out my favourite combination. So far I like chicken, pear and sweet corn, very nice. Slow cooked soups are fun and interesting, I have about three different cookbooks just based on soups, so I have lots more to try and discover. Ok not a soup but also a first timer recipe for me, vegetable croquette which I didn’t deep fry but shallow fried instead, I made them with mashed potato and onions. 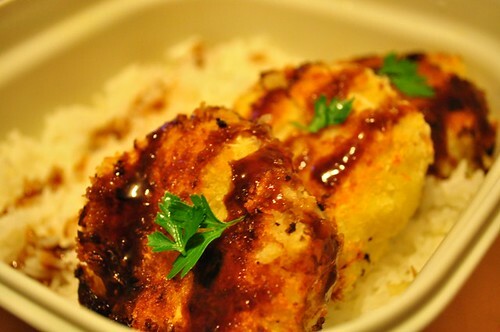 Drizzled with tonkatsu sauce. 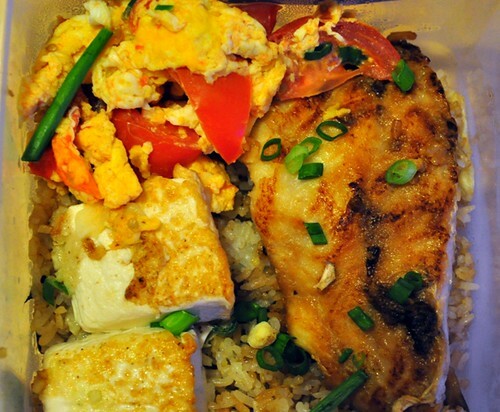 Yesterday’s lunch bento was basil garlic fried rice, ‘yuan’ style pan fried fish fillets with ponzu sauce, tofu steaks (lightly seasoned with garlic, salt, pepper and a dusting of plain flour) and fried eggs with tomato. Why so many things? It was my weekend get rid of stuff in fridge mode. There was a freak storm in Perth today and it was seriously very scary. Didn’t help that my bus broke down in front of a bus stop so we watched the storm catch up to us and lightning flash and thunder rumble before our eyes. Luckily everyone made it safe ok. Unfortunately my room wasn’t so lucky. 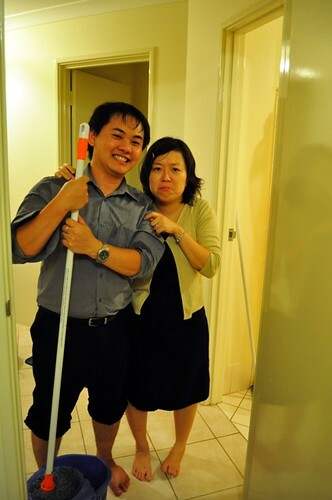 A half shut window meant my room was half flooded and HC greeted me with a mop at the front door and cheerily said ‘bad news! bedroom flooded!’ , Jo’s thunderstorm blown hair was cute though and I couldn’t resist taking a photo. More thunderstorms predicted tomorrow mornings. Ahh well … every cloud has a silver lining right? Cold weather means more soups! Yes I still blog. Just not that frequently anymore (=^^=) I know. The weekend flew by as all weekeneds do. It was a special one too coz it was Xinchen’s birthday. The aftermath of the celebrations. I reckon it was a good one. More tomorrow I promise. 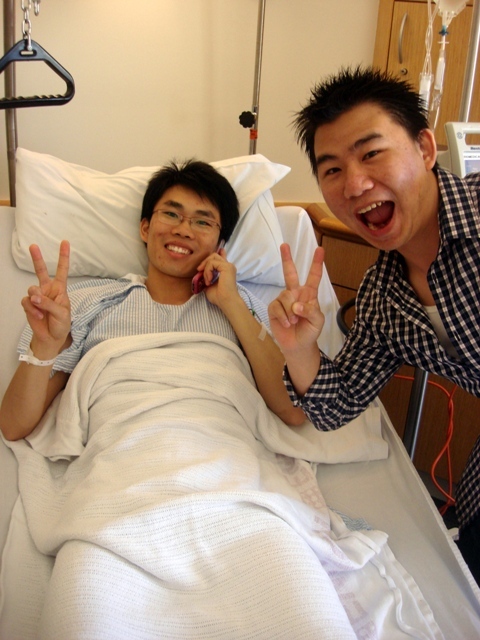 Richard was admitted into the hospital for appendicitis during the weekend and had his appendix removed last night. It was possibly one of the scariest moments of my life and the worst weekend ever. I could probably write a million words on how bad our experience with Royal Perth hospital was, the weird things that one witnesses during a six hour wait in the emergency waiting room and the wonders of private hospitals. But it doesn’t matter now because he’s ok and no longer in pain. See happy smiles and V signs? Silly boys. A million thanks to Gerry who was my shining beacon in the darkness and never failed to make me laugh when I really wanted to cry. And Richard for being horribly stubborn but tremendously brave and positive throughout the whole ordeal, I’m so glad you’re ok now (^__^). I am so looking forward to the weekend, it’s been a long week not in terms of days crawling by but in terms of long hours at work! I am clocking up extra hours in the office and returning home later and later. I forsee long winter days of stepping out of the office only after the sun has long gone down. But I am looking forward to winter. I want to feel cold ( I might regret saying this in winter) again. To envelope myself in warm coats and snuggle up in thick duvets. It was a horrible 38 degrees today and predicted to be even hotter tomorrow. What happened to autumn weather?! 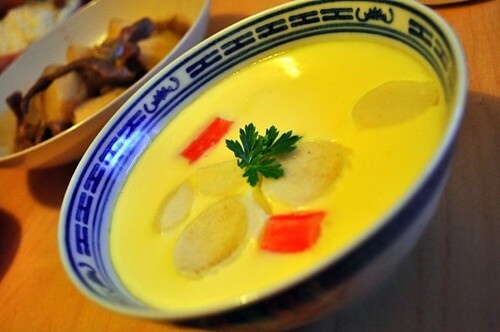 Probably not a good time to have chawan mushi (steamed egg custard) for dinner, but comforting and smooth all the same. 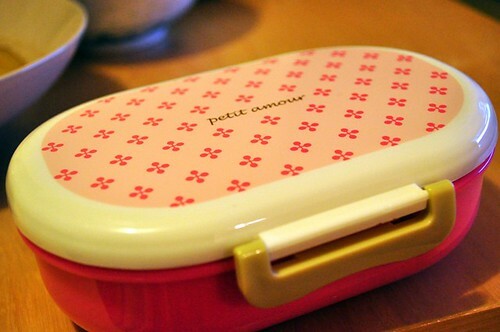 Perhaps Jo will enjoy her lunch bento more if it’s in a new, cute bento box. My bento box collection is growing even though we hardly use them really. 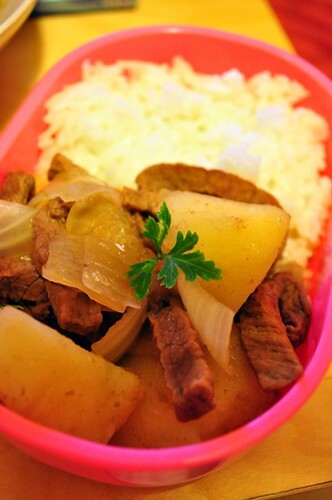 Tomorrow’s bento is Nikujaga with rice, a Japanese stew of meat and potatoes and onions, I used thinly sliced beef for meat, it’s really easy to cook and the gravy is sweet and light. I’m back in the kitchen again (^___^). 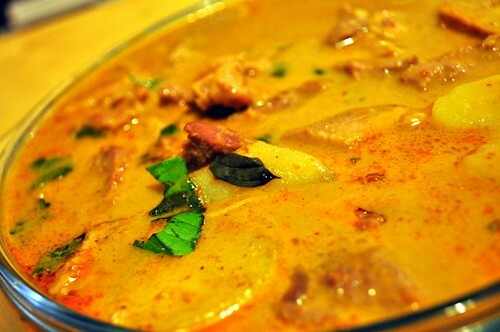 Thai panang curry, I don’t think the authentic version has potatoes in it, but curries and potatoes go so well don’t they? 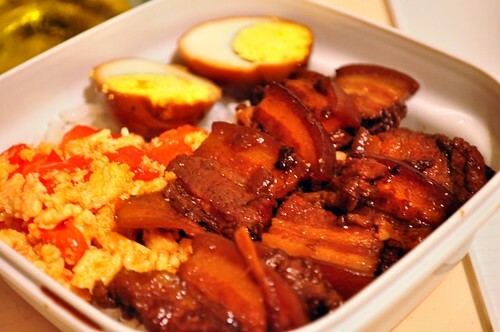 Loh bak with fried tomato egg for lunch bento. My idea of comfort food. 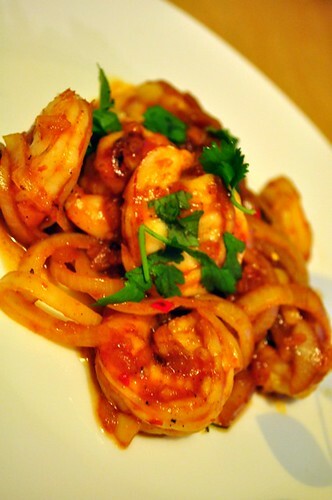 I love new recipes! 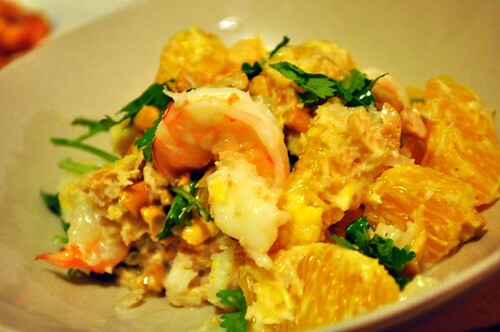 This was supposed to be a Thai pomelo prawn salad, but since I couldn’t find any pomelas, I made do with navel oranges instead. It was yummy, I reckon if I went to Bangkok I would be eating Thai salads for every single meal, so good. The dressing was made of fried shallots, garlic, dessicated coconut flakes, coconut milk, fish sauce, lime juice and roasted peanuts. Really appetising.